I've written a few favourable words about the Icon Patrol Raiden gear in the past but have never done a proper review. However, I am now in a position to do so, having tested it in all extremes over the past year-and-a-half, including one test which no rider ever hopes to experience—how the gear stands up in a crash. Yes, I was particularly pleased at that moment. I purchased the Patrol Raiden suit in spring 2013 in preparation for my Alpine journey. 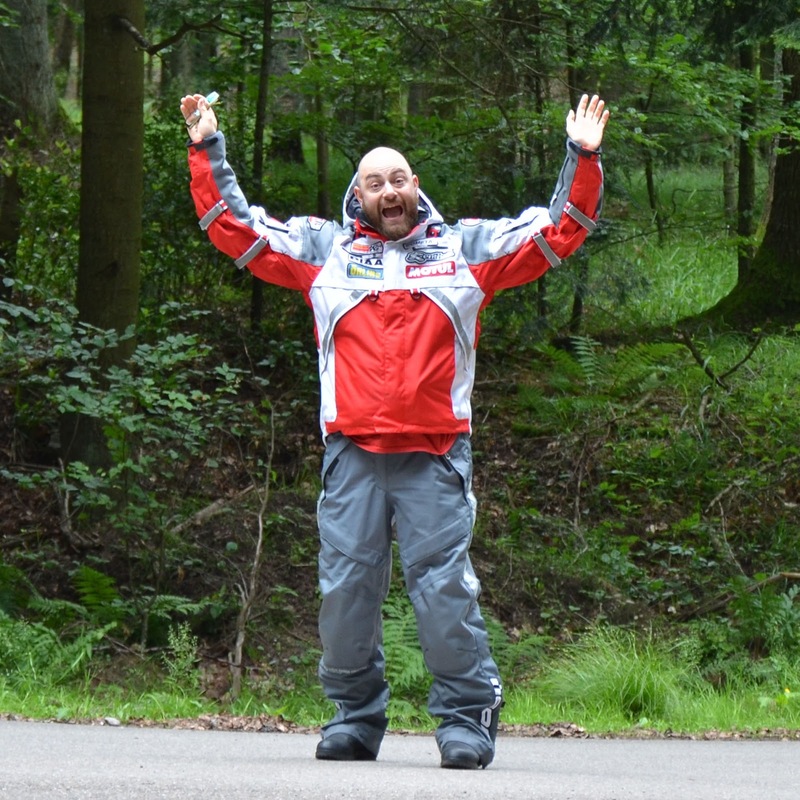 I was coming from the BMW Rallye 3 jacket and City 2 trousers which are high quality items, but the jacket is only waterproof with the liner in place (uncomfortably warm on rainy summer days), and the trousers are not waterproof at all. The Patrol Raiden gear has waterproof shells—with a removable liner in the jacket if added warmth is required—which is optimal for keeping dry and cool(er) when riding on warm, wet days. The Patrol Raiden jacket retails for £370 and the trousers £285 (including our 20% VAT) which puts it in line with mid-range gear in this country. Initial impressions are that the gear is constructed to a high standard with consistent stitching throughout and no loose threads or imprecise seams. Fabrics are substantial and the gear feels weighty and strong. In this respect it is on par with the much more expensive BMW gear. 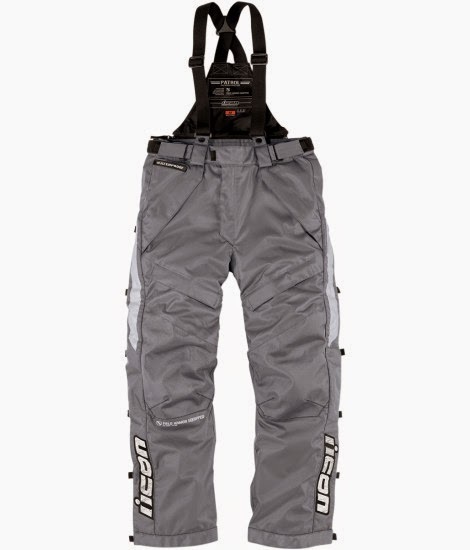 The Patrol Raiden gear (along with the standard Patrol gear) appears to be inspired by the snowboarding industry both in style and in fit which is no bad thing in my opinion. It is all about unrestrictive, comfortable and casual style. For this reason it stands out as much from the ultra-conservative and functional crowd in tailored dark-coloured adventure touring gear as with the look-at-me crowd in squeak-when-you-walk, quasi futurist, cyberdog-style catsuit racing gear (unless you are a model specimen of human body shape perfection, this type of gear is a big, resounding no, regardless of your delusions of body self-image, thank you very much—just no). Some bad news, however—where the Patrol Raiden gear falls short is in the protectors. Elbow, shoulder, knee and hip protectors are included but they are cheap and nasty at best—and just an empty pocket exists where the back protector should go (although I understand from late 2013 a non-accredited high density foam back protector has been included). To bring the gear up to a level of safety with which I was comfortable, I had to spend another £100 on CE Level 2 D3O protectors all round (including back protector). Shame on Icon for not including these as standard in the first place on their flagship 'adventure' gear. The gear uses fabrics of varying textures from a coarse weave on impact areas to a finer weave on other panels. The white panels have a dye sublimated topographic pattern which works remarkably well at masking light staining from dust and road grime—some clever attention to detail. The colour scheme is bright and gets noticed—this may put off some buyers but I prefer to be as conspicuous as possible when I'm on the road. I've had a chance to use the gear in sub-freezing temperatures with snow falling to near desert temperatures in the high 30s (°C, that is), as well as in some extreme rainstorms. It performs as advertised which means I have remained dry and as comfortable as possible throughout, with some minor exceptions as noted below. The jacket fits on the larger side, particularly with the liner removed. There are 12 rubber-sealed, zippered vents which enable a high level of airflow on warmer days—it goes without saying that all 12 need to be zipped closed when it rains or water will come in. At temperatures above 13°C I'm perfectly comfortable without the liner wearing just a t-shirt underneath. Below this, the liner is effective to -10°C from firsthand experience, although I suspect any colder would require some type of heated gear to maintain comfort. In the wet, the sealed vent zips work effectively to keep out water, and the main zip is doubly secured with a magnetic flap running the length of the jacket. This flap is notable as I would never want to go back to poppers after the convenience of these magnets. The jacket is equipped with a removable hood (handy for keeping dry after parking the bike on a rainy day) and pouch on the back which can take a third party 1.5-litre hydration pack. Neither of these items interfere or flap about at speeds tested up to 120mph on the German autobahn. The arms have hook-and-loop straps to adjust the fit and help to keep the elbow pads in the correct positions. There are countless pockets throughout, including a specially sealed mobile phone pouch on the inside left breast. One of the pockets has a cloth attached to an elasticated cord for cleaning your visor, and another, peculiarly, has a St Christopher charm sewn in. A good omen is a good omen, after all. As with any waterproofed gear, the fabric does require re-treatment from time to time to maintain water repellency. I found myself slightly damp on the arms after a particularly wet ride when the jacket was about a year old, but this was resolved using a commercial spray-on fabric waterproofer. The jacket has a tail to keep your lower back well-covered when seated on the bike—I've not had any need to connect the jacket and trousers thanks to this feature. The trousers are not as form-fitting as most other motorcycle trousers—let's just say gents will not go sterile wearing them. They are considered over-trousers, but I have always worn them on their own. Hook-and-loop straps enable easy adjustments the waist, accompanied by standard belt loops. The trousers come with braces (aka suspenders) which attach at the back via a zipper—I prefer using a regular belt and leaving the braces at home. A double-ended zip runs the length of each leg up to the waistband making it easy to air out your legs on hot days when stopped. The zips are doubly secured with magnetic flaps in the same way as the jacket. The bottoms of each leg have poppers to shorten the length to one of two levels, if necessary. The trousers come with two sets of removable stirrups to prevent them riding up your boots but I have had no need for these. The knee protectors can be adjusted to one of three heights to ensure they are positioned correctly. There are two zip pockets at the front, two button-up cargo pockets on the knees and two on the back. I would recommend not putting anything pointed or oddly shaped items in the cargo pockets as these could cause injury in a crash. The trousers do not restrict movement due to their relaxed fit which is helpful when riding off road. They have proven to be waterproof in all intensities of rain, apart from one torrential motorway journey in France, where they eventually allowed some dampness to come through to the undersides of my thighs due to persistent spray from the bike's tyres. 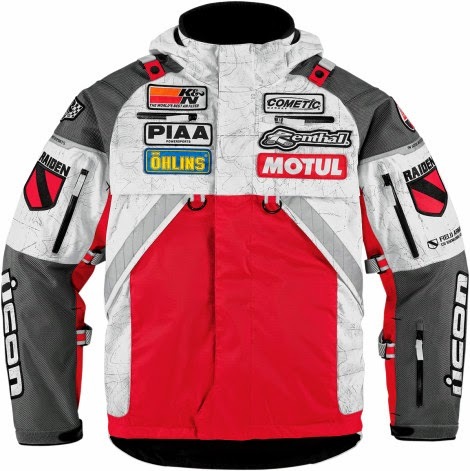 I had the misfortune of putting my Patrol Raiden gear through the ultimate test in the Czech Republic when I came off the bike at 45–50mph and slid to a stop on the tarmac. I won't go into detail about all the damage (you can read about it here) but will simply say I walked away from that crash with not so much as a cut or bruise despite bashing my knee quite hard on the tarmac. A bit of luck notwithstanding, the gear is up to task with one caveat... upgrading the rubbish stock protectors with some quality D3O protectors (available directly from Icon)—and once again, Icon, these should be standard! Quality gear at a fair price—the whole suit coming in at around £750 including the D3O pads. The Patrol Raiden gear compares favourably in materials, workmanship and features to the BMW Rallye 3 suit which totals £1,000. Care is straightforward—after removing the pads they can be chucked into the washing machine on the handwash cycle with some mild handwashing detergent. And once a year a waterproofing treatment is necessary. For riders who are not bothered about the lairy colour schemes and who can appreciate the extra conspicuity this offers, this gear works as advertised from touring to off roading. It is something a little bit different from the usual sea of black in the gear isle of your favourite motorcycle shop. A year-and-a-half on, with the exception of the recent crash damage, nothing is wearing unduly and all seams look as new as they did on day one—as expected from a quality product. Putting my money where my mouth is, I have been so pleased with this gear that I am replacing it like-for-like following the Czech incident. The jacket is available in red, orange and grey, and the trousers are available in matching grey. Find out more at www.rideicon.com. Do you have Patrol or Patrol Raiden gear? Let me know your thoughts in the comments below.